Sales of the ‘I Am Vermont Strong‘ commemorative license plate have been brisk since they were introduced in February in response to Tropical Storm Irene. And Thursday, Governor Peter Shumlin marked a milestone by buying the 25,000th one to be produced. At a news conference, Shumlin presented the plate to Barre Fire Captain Keith Cushman, with thanks to him and others around Vermont for their work responding to last year’s natural disasters. The $25 plates have been sold at supermarkets, ski areas and other businesses, and proceeds are going to the Vermont Disaster Relief Fund. Shumlin says the sale of the 25,000th plate means the campaign is well on its way toward its fundraising goal of $1 million. 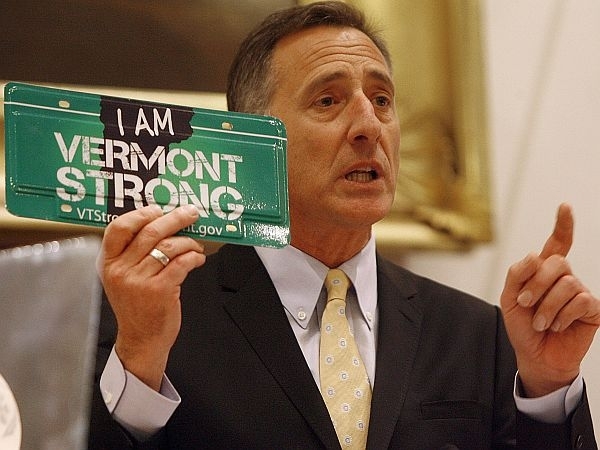 Governor Peter Shumlin has signed legislation allowing Vermonters to use "I am Vermont Strong" plates on the front of their cars and trucks. Organizers are hoping sales of the plates will raise more than $1 million for the people who suffered damages from Tropical Storm Irene. VPR’s Bob Kinzel talks with Eric Mallette, co-founder of the "I Am Vermont Strong" campaign that has sold more than 7,000 t-shirts to benefit the Vermont Food Bank. Their graphic is also being used for the new "Vermont Strong" license plates.